Joannes Designs Week6 'Moods' quilt was a design I created with teenagers in mind. They seem to love black and as a parent it is easy to add colour with a throw, pillows or a treasured childhood toy! 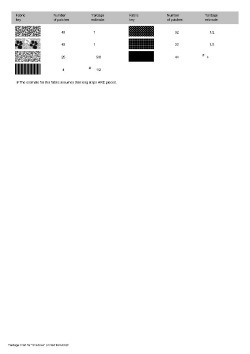 It is made from one block that is repeated 16 times. Each block measures 12" x 12" and uses only two contrasting fabrics. I have seen this block named several different ways - 'Economy Patch', 'Hole in One', 'Square in a Square' etc. I have decided to name my version of this block 'Mood Block'. Half of these blocks are made using an alternate fabric choice. 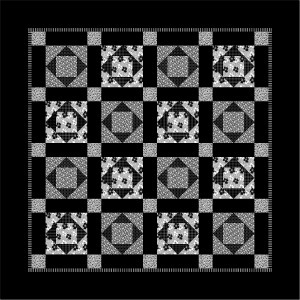 In this quilt I have used only black, white on black and black on white fabrics. 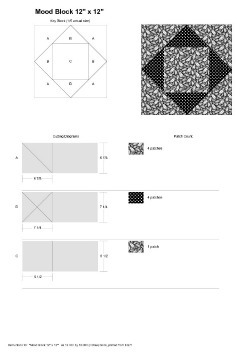 I have added a rotary cutting guide under the pattern as a reference for how much fabric you will need to create this quilt top. I am trying to keep the pattern instructions as simple as possible and on one sheet of paper. 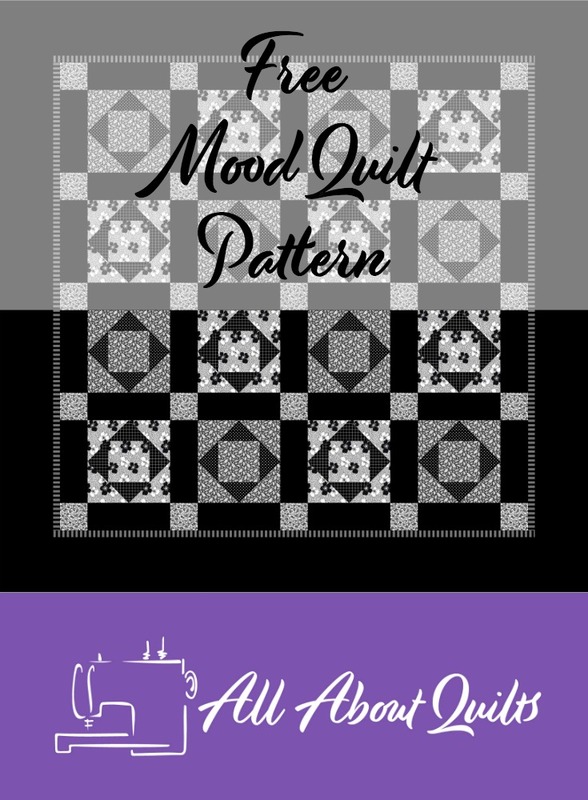 With that in mind you need to remember that there are two different colour-ways for the 12" mood block and my quilt assembly instructions don't specify that half of the blocks are made in a different colour-way. 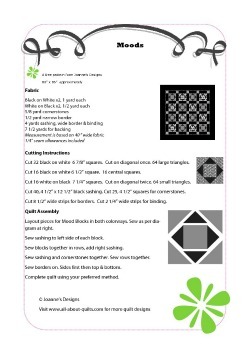 You can make the central blocks using Marti Michell's Template Set A if you prefer. 1. Sew together the sixteen blocks first. Remeasure each block & trim where necessary. 2. Lay these blocks out on a flat surface or design wall. 3. Add the sashing to the left hand side of each block. Then sew together in rows. Add sashing to right hand side of each row. 4. Sew corner stones & sashing together in rows. 5. Sew rows together as shown in pattern. 6. Sew narrow border on. Sides first then top & bottom. 7. Sew wide border on. Sides first then top & bottom. I hope you enjoyed Joannes Designs Week6. Just 46 patterns to go!